Through a competitive application process, Learning in Action supports faculty and staff interested in designing and implementing best-practices experiential learning opportunities (ELOs) to support undergraduates’ problem-solving skills. Note: As members of professional learning communities, faculty/staff selected for participation are expected to attend all meetings with their learning community and the Fall Learning in Action Summit. All University of Alabama faculty and staff interested in developing and using best practice-based ELOs are eligible to apply. Learning in Action has a particular interest in engaging diverse student populations and providing unique opportunities to actualize creativity and innovation in teaching and learning. Interested faculty and staff should apply by March 9, 2018. Download application. 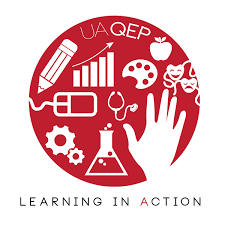 For more information, visit learninginaction.ua.edu, or contact the QEP director at experience@ua.edu or (205) 348-7899.